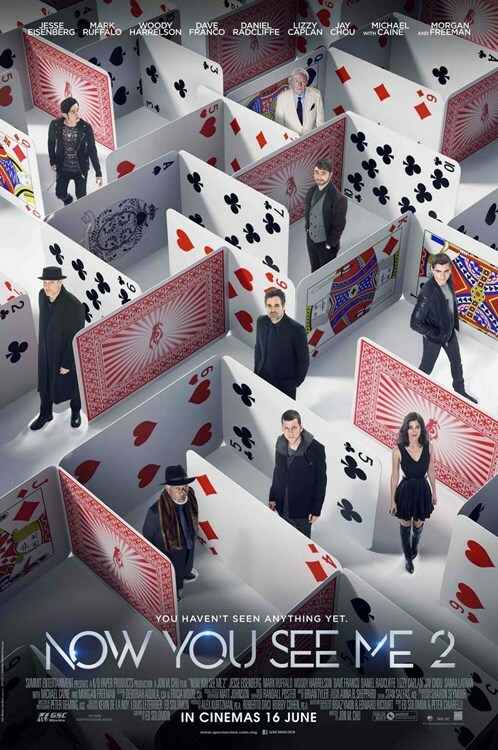 NOW YOU SEE ME 2 Movie Synopsis : THE FOUR HORSEMEN [Jesse Eisenberg, Woody Harrelson, Dave Franco, Lizzy Caplan] return for a second mind-bending adventure, elevating the limits of stage illusion to new heights and taking them around the globe. One year after outwitting the FBI and winning the public’s adulation with their Robin Hood-style magic spectacles, the illusionists resurface for a comeback performance in hopes of exposing the unethical practices of a tech magnate. The man behind their vanishing act is none other than WALTER MABRY [Daniel Radcliffe], a tech prodigy who threatens the Horsemen into pulling off their most impossible heist yet. Their only hope is to perform one last unprecedented stunt to clear their names and reveal the mastermind behind it all.